I’m at that point in my Pie Are Square shawl* that its just me and the shawl. I’m alone with this knit. But I don’t mean that in the depressing way or even in the physical way. I mean that it’s all scrunched up on the needles and no one can really get a good look at it. 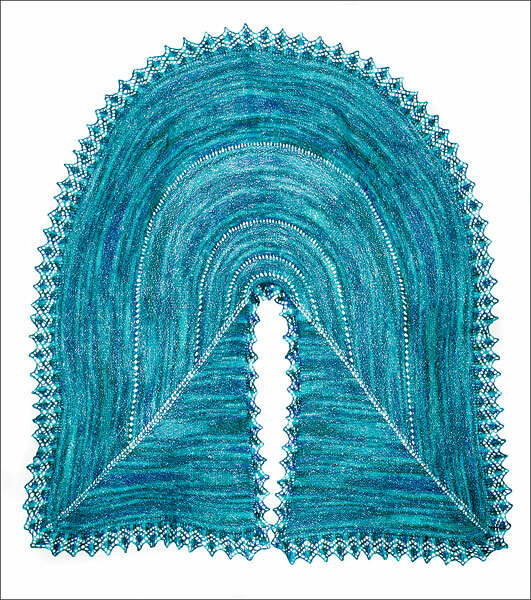 The shawl has gotten big enough that it can’t be spread out or examined or shown off. No one looking at it can tell how big it is. Most people, especially non-knitter people, can’t even tell what general thing my knitting will become. I could tell them its a baby blanket or a in-the-round cardigan or a sleeping bag. They would have to take my word for it. They also have to take my word for it that this knitting is going well and coming out just they way I’d hoped. I can see my shawl… but only in my head. 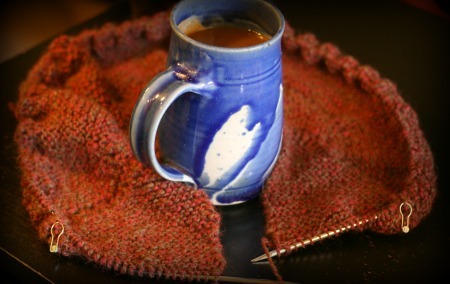 I’ve pieced together a picture of it from watching it pass, inch by inch, under my hands as I knit row after row. I know its shape, its general size, and how its going to drape. But no one else knows that because I’m the only one knitting on it. I think they will be surprised at how big it is and how much of this shawl is dedicated to crossing and overlapping in the front. I think they might even be surprised when it actually done. After all once a project reaches that scrunched up on the needle stage it seems as if the knitter makes no progress. And only I know that the shawl is a whole third of a skein bigger. It only seems like nothing is getting done. But it is. I know that because I, and I alone, am alone with this knit. But that’s okay. We get along just great. 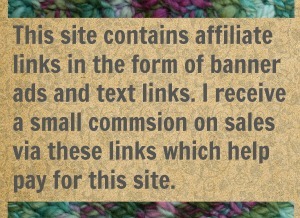 16 Comments on "When its just you and the knit"
What a beautiful Shawl!!! Wish I was a better knitter, but crochet has been my hobby since my grandmothers taught me as a child!! However, have started my Nick blanket kit from We Are Knitters and am quite proud of myself on how the knitting is going. Maybe someday I will be as great a knitter as you are!!!! Love the color of the shawl you are working on!!! What type and color of yarn are you using???? Thanks! And this shawl if very, very easy. Its all just knits and yarn-overs. 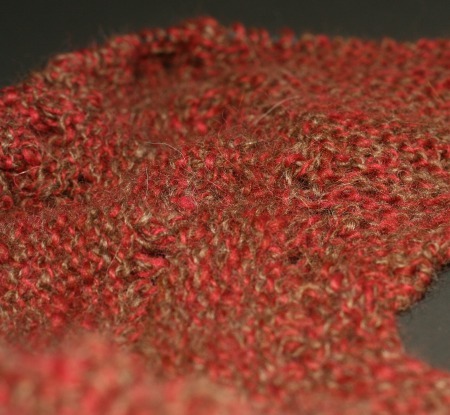 As for the yarn, its a handspun that I made about… two years ago. Its a two ply and each single is from a different source. I felt pretty clever getting them to combine like that. The brown is 100% Alpaca from a farm, washed and combed by my mom. The maroon is 50% Alpaca and 50% Corriedale from Fibers for Ewe (which is now out of business). I really hope you are feeling better and your babies are having a better day. I love the shape of this shawl. Not only does it look beautiful but more importantly it looks useful. Your color choice is really nice. I may just have to give this one a try in the near future. I recommend it. Its of simple design and construction which makes for a great brainless knit. 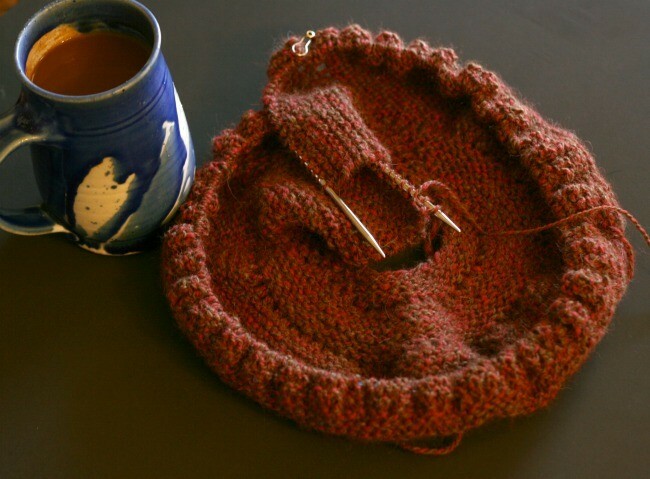 Or it makes for a great “first big project” for an adventurous new knitter. I am feeling better thanks. 🙂 I’m down to just the runny nose and dealing with all teh chores that didn’t get done while I laid around all miserable. How cool is the shape of that shawl!!! And I love the red/brown colors you chose. I can relate to your message today. I love being in that zone where no-one can tell what I am making. My friends love asking to see my progress and I keep them guessing as to what I am making. I love being the only one to know. And in the end, the ones that guess correctly celebrate themselves being so clever to figure it out before everyone else. I enjoy your writing very much, thank you! 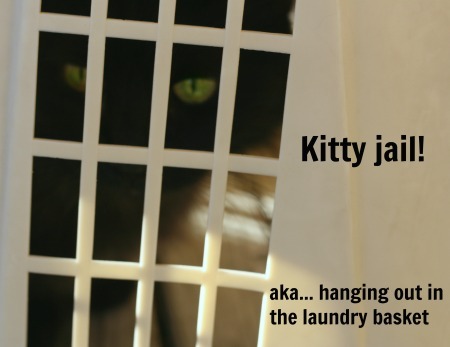 Its a special time in the life of a knitting project. When you know how its going to look, about how long its going to take and you haven’t gotten sick and tired of it yet. I call it mid-life of a big knit project. I think that is when you and the project are best friends. It would never occur to me to make people guess. I should try for more mystery. Those are the project that we bond with. I think so too. If its big enough to last for a few weeks it finds a place in my memory and I’ll always think and of whatever I was doing and associate it with that project. I too have been working a never ending shawl. I was 14 rows away from the end. I stood up and the cable broke…..everything tumbled to the floor…I gently put it on a table and there it sits waiting for me to “restring” all the stitches…it has been two days of my ignorING it…time to pick-up -sticks…stitches, rather. Btw…yours looks gorgeous! ☺ I hope things go better for you now. Yikes. The cord on the needle broke? Oh wow. That’s terrible. Was it one of those interchangeable needle sets? 1) institute a self-bribe system. As in, I can eat a doughnut after they are all picked up. Or I can’t pick up and read my book until I’ve picked up half the testicles. 3) I cuss a lot. maybe some of that will help. Good luck.